To assess how well an organization is achieving its desired objectives, several types of performance measures are available worldwide, many of them standardized and comparable, others specific to particular segments. Some metrics have a direct influence on the market value of a company, like those related to revenue, profit, debt / revenue, free cash flow, returns on investment and earnings before interest, taxation, depreciation and amortization. However, mainly in the process industries, the intrinsic value of the enterprise is much more than that. Sustainability of valuable programs requires broad concepts and results can be compromised or worthless if reliability and safety are not central variables for decision-making. Each company defines its value drivers differently, with their own uncertainties and clear interactions between them. Based on that, a value-driven asset management strategy requires that metrics, communication and a structured feedback loop are uniform between company departments. A fully integrated risk management strategy should lead to higher quality decision making. For this article, the authors focus on life cycle risk management of physical assets (fixed equipment and piping) and what business aspects it affects, for example, capital and operational expenditures, availability and others. A case study is the basis for discussing a process-based risk management strategy and strategies for the efficient and reliable use of industrial assets. Risk considers the effect of uncertainty on objectives1. When related to physical assets, or industrial equipment, the expected performance is to develop activities for the process, in planned intervals, relating to their inspection / maintenance strategy. One important industry event, scheduled turnarounds, occur during physical assets’ life cycles, on planned intervals. Then, for example, higher or lower intervals between turnarounds can affect risks, as they may represent deviations from the objectives, positive or negative, respectively. A process is a set of actions ordered and integrated for a particular productive goal, which will generate results, services and/or information2. Processes are the results of systems in action, represented by flows of activities or events. To represent asset life cycle, Figure 1 shows the main processes of an industrial production unit. It is not a rule that these processes will define exactly how departments should be organized, but to manage asset life means that they flow in a planned and controlled manner, as established in the applicable risk analyses. During the equipment life cycle, anomalies are expected to occur, and a structured, predictive integration strategy should therefore be systematically applied, composed of a process based on historical data and continuous improvement, like the Plan-Do-Study-Act (PDSA) cycle established by Deming3. Figure 1. 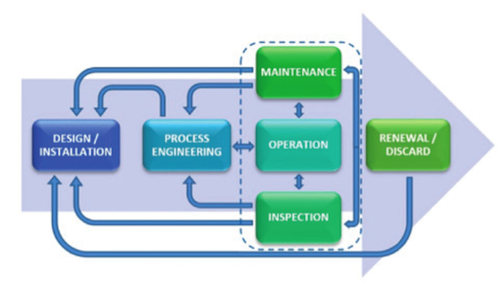 Asset life cycle represented by the main processes of an oil and gas company. If strategic integrated objectives are inside each of these processes, it’s clear that they are intrinsically connected. Otherwise, metrics to measure company performance are not always connected to those used by each department, or even by each worker, to supervise their day-to-day activities. There are always specific values defined to drive decision-making, as a part of the strategy, directly associated with objectives, such as shared principles, culture and some level of risk. As mentioned by Custodio4, decisions don’t make themselves – people make them, and there isn’t always a chief risk officer present when they do. Based on that, more than the objectives, perspectives for each process management should unify the concept that drive results for each process indicator (PI) that are directly proportional to key performance indicators (KPI). When a part of any process fails, indicators should detect an efficacy loss, and anomalies should be studied and understood to ensure continuous improvement. These concepts are applicable to any family of process management, but the focus here will be those related to asset life cycle, briefly described in Table 1. Table 1. Examples of activities related to main processes related to asset life cycle management with examples of potential issues to be detected and studied. Original concepts of production process, for stakeholder needs. Original risk analysis for process units. Sizing and analysis of pipe flexibility / materials selection. Quality control – manufacturing, installation and commissioning. Pending implementation of design actions from risk analysis. Use of unsuitable material for the specified operating condition. Cracks caused by error in calculation of pipe flexibility. Manufacturing defect not detected by quality control. Definition, monitoring and studying of process parameters. Definition of tolerance ranges for process variables. Critical analysis of process units’ performance. Early asset degradation caused by process variables without a defined tolerance range. Changes in the process without analysis for mechanical integrity impacts. Implementation of operational processes, considering process parameter ranges. Alarm management and corrective actions. Operation with process variables out of mechanical integrity tolerance range. Definition / systematic revision of damage mechanisms and applicable inspection technics. Recommendations to repair defects or failures (where applicable). Ineffective inspection plan for known deterioration mechanism. Failure on the implementation of inspection plan. Low quality of inspection service. Implementation of repairs recommended by inspection / maintenance. Ineffective maintenance plan for known deterioration mechanism. High backlog of defects / failures recommendations to repair. Low quality of maintenance service. Substitution of equipment at the end of life cycle. Management of change – design improvements. Decommissioning obsolete equipment and systems. Operation of equipment with known end of life cycle. Failure on management of change for design improvement.